HOUSTON & DALLAS–April 09, 2019–(BUSINESS WIRE)–Pinnacle Midstream II, LLC (“Pinnacle”) today announced a significant equity capital commitment from management and Energy Spectrum Partners VIII LP (“Energy Spectrum”). Headquartered in Houston and established in early 2019, Pinnacle is an independent energy company focused on the development of energy midstream infrastructure for oil and gas producers working in various basins across North America. Pinnacle is pursuing organic greenfield projects, strategic producer partnerships and select acquisition opportunities with a focus on Texas and the surrounding states. Pinnacle’s four Partners have more than 75 years of combined experience in the energy industry. Most recently, the Partners led the successful development and ultimate divestiture of Pinnacle Midstream, LLC’s western Delaware Basin midstream platform in November 2018. >>Mr. Tanous has over fifteen years of industry and executive financial management experience. Mr. Tanous served as Chief Financial Officer at Pinnacle I. Previous to Pinnacle, Mr. Tanous was a founding partner of PSI Midstream, a private equity-backed midstream startup where he had numerous financial responsibilities. >>Mr. Hillerman has more than fifteen years of experience in the engineering, construction and operation of midstream and downstream facilities. He has designed, built and operated natural gas pipeline and processing plants as well as crude oil gathering, transport and refining facilities. Prior to joining Pinnacle I, he was VP of Engineering and Operations at PSI Midstream. He started his career with ExxonMobil where he developed and executed multiple large-scale capital projects in addition to holding several assignments in operations. >>Mr. Ward has held a variety of roles in the energy industry for the past 10 years. His expertise includes business development, commercial, customer relationships, large capital project oversight, commodity marketing, capital raises, acquisitions and divestitures. Mr. Ward was previously CCO of Pinnacle I and held past senior level positions at Twin Eagle Midstream and Kinder Morgan Energy Partners. Pinnacle Midstream II is an independent energy company that provides a full suite of midstream services to oil and gas producers across North America. Headquartered in Houston, Pinnacle is led by a team of seasoned industry professionals who together have more than 75 years of experience in the energy industry, all of which previously led and divested the Pinnacle Midstream, LLC western Delaware platform. Pinnacle is backed by a significant equity commitment from management and Energy Spectrum Partners VIII LP. Founded in 1995, Energy Spectrum Capital (“Energy Spectrum”) is a Dallas, Texas-based private equity firm focused on partnering with premier management teams that are pursuing compelling opportunities in the midstream sector of the North American oil and gas industry. 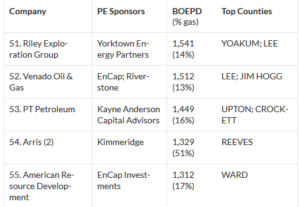 To date, Energy Spectrum has successfully raised approximately $4.4 billion of equity capital across eight funds. The Pinnacle investment will be an investment in Energy Spectrum Partners VIII LP, the firm’s most recent fund.